Hue, Value, Saturation | learn. In short, color is the visual byproduct of the spectrum of light as it is either transmitted through a transparent medium, or as it is absorbed and reflected off a surface. Color is the light wavelengths that the human eye receives and processes from a reflected source. For the physics behind color, see the Primary Color Models page. This will REALLY help you understand how color works! 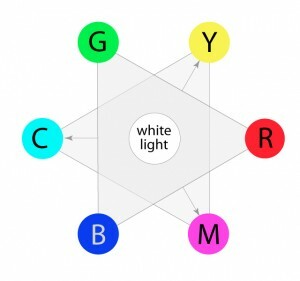 When discussing spectral “light primaries” (RGB), a pure hue equivalent to full saturation is determined by the ratio of the dominant wavelength to other wavelengths in the color. As is discussed on the “Elements: Value” page, value refers to the lightness or darkness of a color. It indicates the quantity of light reflected. When referring to pigments, dark values with black added are called “shades” of the given hue name. Light values with white pigment added are called “tints” of the hue name. 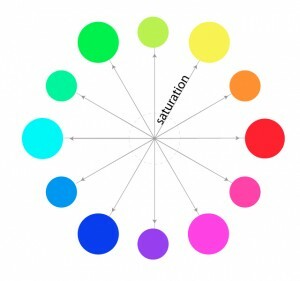 Saturation defines the brilliance and intensity of a color. When a pigment hue is “toned,” both white and black (grey) are added to the color to reduce the color’s saturation. 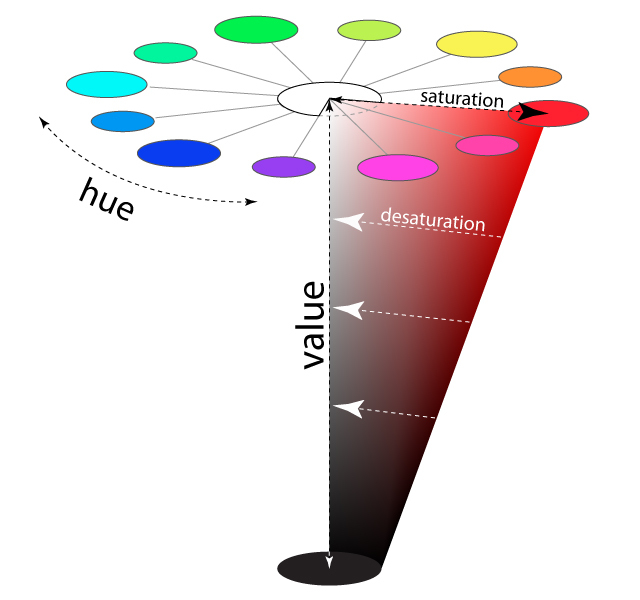 In terms of the “additive” light color model, though, saturation works on a scale based on how much or how little other hues are represented in the color. 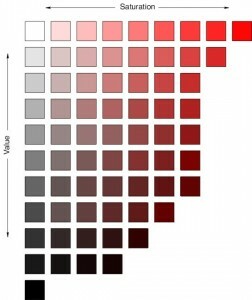 The HSV scale clearly stands for “Hue, Saturation, Value.” It does a better job at visually explaining the concept of light, and it is a very useful one to comprehend, as it is what most sophisticated digital color pickers are based on (including all Adobe software). Not only do graphic designers need to understand this color construct, but fine artists do as well since digital art and rendering has become such an integral part of art processes. Regardless of the two Additive and Subtractive color models, all color is a result of how our eyes physically process light waves. So let’s start with the light Additive model to see how it filters into the Subtractive model and to see how hues, values and saturation interact to produce unique colors. 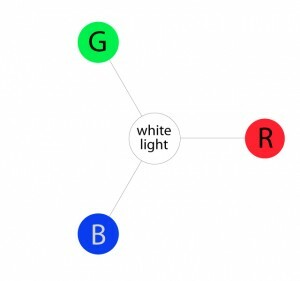 The three primary hues in light are red, green, and blue. Thus, that is why televisions, computer monitors, and other full-range, electronic color visual displays use a triad of red, green, and blue phosphors to produce all electronically communicated color. As we mentioned before, in light, all three of these wavelengths added together at full strength produces pure white light. The absence of all three of these colors produces complete darkness, or black. 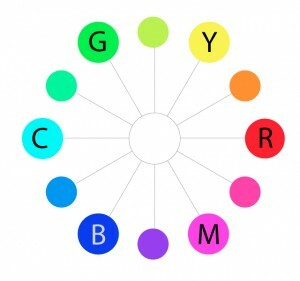 The colors on the outermost perimeter of the color circle are the”hues,” which are colors in their purest form. This process can continue filling in colors around the wheel. The next level colors, the tertiary colors, are those colors between the secondary and primary colors. Saturation is also referred to as “intensity” and “chroma.” It refers to the dominance of hue in the color. On the outer edge of the hue wheel are the ‘pure’ hues. 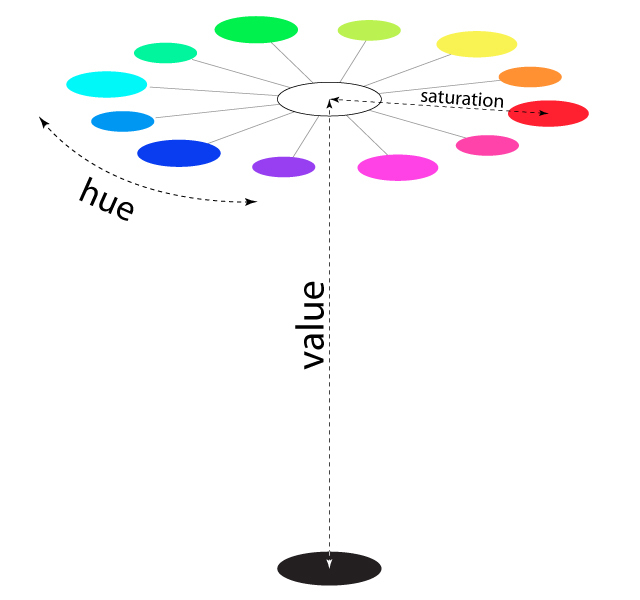 As you move into the center of the wheel, the hue we are using to describe the color dominates less and less. When you reach the center of the wheel, no hue dominates. These colors directly on the central axis are considered desaturated. Naturally, the opposite of the image above is to saturate color. The first example below describes the general direction color must move on the color circle to become more saturated (towards the outside). The second example depicts how a single color looks completely saturated, having no other hues present in the color. 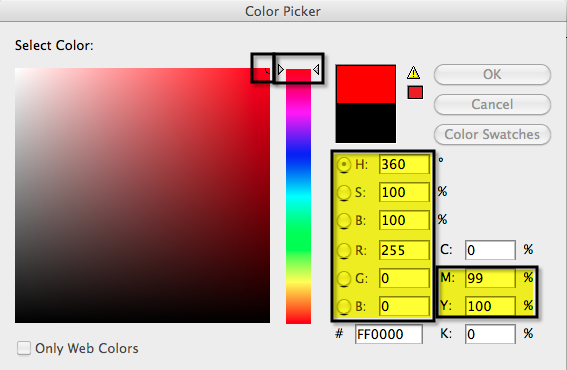 With this explanation, it might be much easier to then understand how modern color pickers work. There are many types of color pickers, but this example will focus on the common Adobe software interface picker, continuing to use the red hue as the example below. By the way, relate the similarity of our cone-shaped red slice above to the “Select Color” window below to better visualize how this works. In Figure-1 below, first notice the center vertical slider. This is where we select the hue. It is currently set to the lowest selection and corresponds to the “H:0” radio button value on the right. The “H” indicates “Hue,” and the zero value describes which numerical hue assignment we have selected. Below it, you will see that “Red” is set to “255,” or the fullest level of light represented on a computer (0 = lowest). 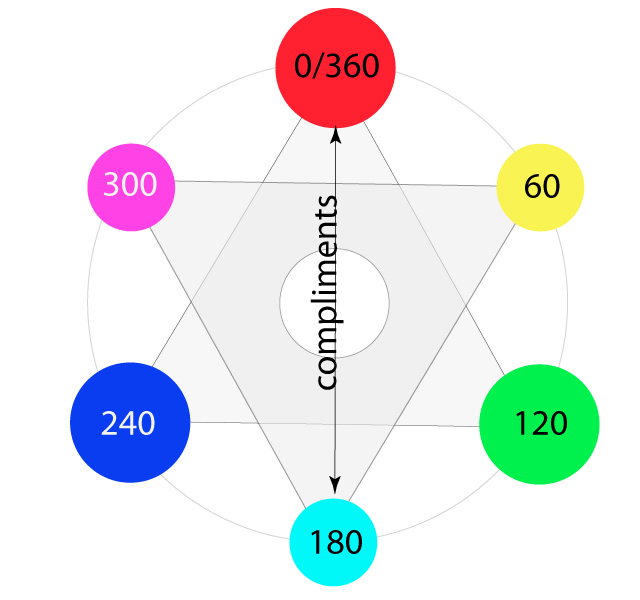 Notice that Blue and Green are set to zero, indicating that Red is at its fullest level of saturation. Next, notice where the picker circle is in the “Select Color” window. It is located at the top-right, indicating where on the scale you want the saturation to fall. As we said, the sample is equivalent to the purest red hue with full saturation, and it corresponds to the outermost edge of the color wheel. 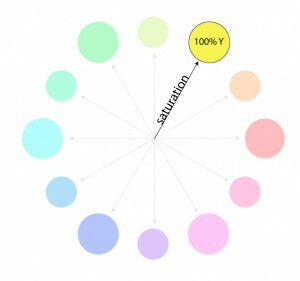 The “S:100%” on the right describes the level of saturation in the color we have selected, and the “B:100%” corresponds to the brightness, or value. As a side note, notice that under the CMYK levels that Yellow and Magenta are basically equally represented at their fullest capacities. This supports how in the Subtractive Color Model, red is a secondary color of yellow and magenta. Now, as a means of comparison, look at the next model. Do you see the difference? 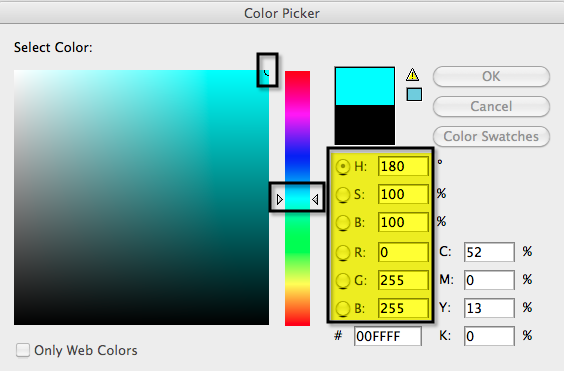 In case you don’t see the difference, it is in the Hue number setting and where the slider is located. This is essentially the same hue as in the previous Figure-1, except that the setting has gone from 0 to 360. This is because we are basing it on the HSV cone model as illustrated earlier, and the hues at the top of the upside-down cone are in a full 360-degree circle. Thus, we have completed the circle by starting at the zero-level red and moving through the full visible spectrum to the same 360-level red. To get a more complete picture of how this works, lets look at the RGB equivalent of “cyan”, which is directly across from it on the color wheel, and is thus red’s complementary hue.